This lavishly elegant sofa will create an intriguing focal point in any room of your home. Luxurious patterned loose back pillows create a distinctive look, while the deep, plush seat cushion supports you in luxurious comfort and style. Sophisticated rolled arms are wrapped in bi-cast leather and accented with intricately hand carved solid wood with hand applied gold tipping which continues along the front and seat back for an exquisite style that is sure to impress. Simple wooden feet are a nice touch. 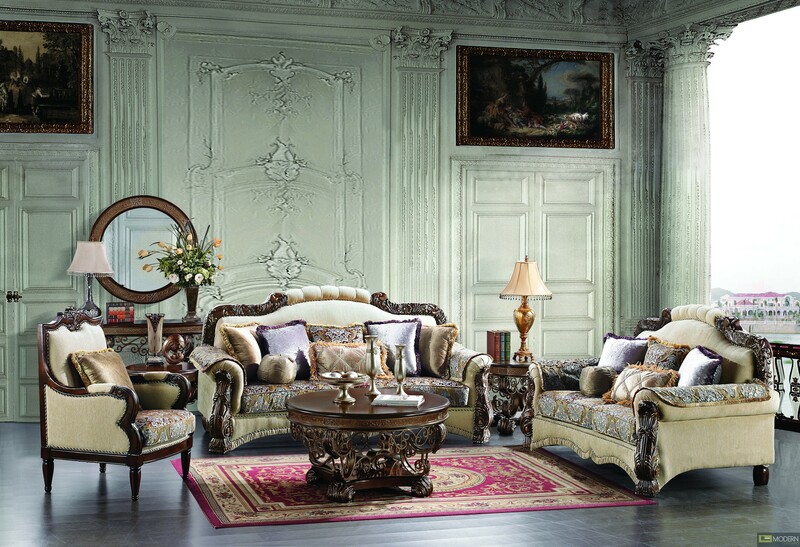 Add this regal piece to your living room to create a warm and stylish space that everyone will admire. This fashionable love seat will create a sophisticated look to your formal living room. The elaborately carved wood frame wraps the curves along the front of the arms, the bottom of the frame and the top of the seat back, while wooden bun feet offer support and added detail. The leather upholstered rolled arms add to the traditional style of the piece. Decorative accent pillows add the finishing touch to this classic love seat. Dramatic style and uncompromising comfort are brought to life in the exotic shapes, vibrant colors and detailed wood carvings with hand applied gold tipping this amazing love seat has to offer. Complete this gorgeous ensemble with the stylish matching chair. The decorative carved wooden frame wraps the curves along the front of the arms, the bottom of the frame and the top of the seat back in a rich, medium tone finish with hand applied gold tipping. The plush seat cushion and accent pillows provide comfort without compromising the sophisticated design. The rolled leather arms create a traditional look you will love in your home.